Vegetable oil — 1 Cup. Baking powder — 1 sachet. Boiled condensed milk — 1 Bank. Mix with sugar (100 g) chilled egg whites with a pinch of salt. Separately beat egg yolks with sugar (50 g). Mix egg yolks, sugar, vanilla, add vegetable oil, stir well, then dilute with milk, sprinkle in the cocoa powder, stir again. Sift the flour together with the baking powder. Gradually adding flour, stir the dough and so to obtain a homogeneous chocolate mass. Do not forget in the process to add the whipped egg whites. Now pour the dough into a large round shape and bake at 180 degrees for 45-50 minutes. Chilled ready the cake should be cut horizontally into 3 equal cake. You can also bake the dough for 2 times and then cut the cake on every 2, then you’ll have 4 cake layers. Cream: mix the boiled condensed milk with softened butter and add melted chocolate – 1 tile, stir well and coat the cake and roll the sides. The second bar of chocolate to melt in the very end of the process, and pour over them the finished cake. 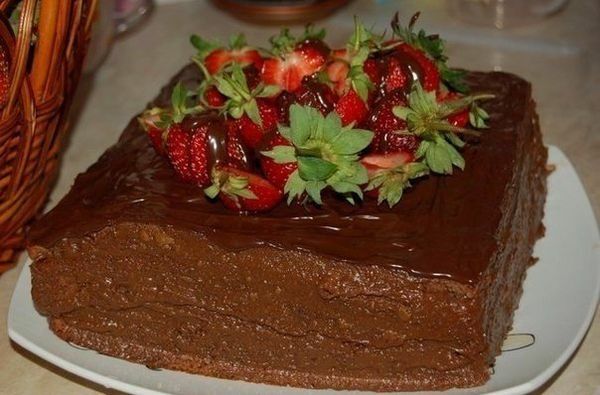 To decorate the cake with strawberries and refrigerate.